Using organic baby bedding is one more way to make sure baby is safe at nap and bedtime. Studies show that many bedding products contain many harmful chemical and agents added to reduce flammability among other things. These are the same products that you baby will sepnd countless hours resting their head on, laying their bodies, and touching their soft and sensitive skin. To me the best choice is going organic. 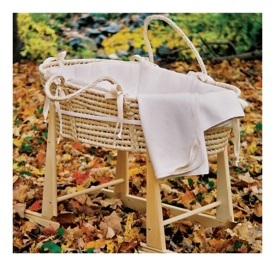 An alternative to a traditional bassinet is this organic moses basket and rocker. The basket contains organic French fleece and flannel, and white bedding of 100% organic cotton. 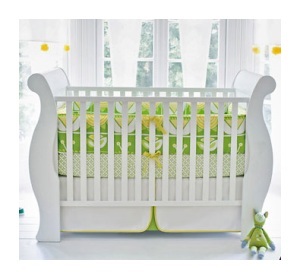 I am so in love with this Serena and Lily Maggie Organic Three Piece Crib Set. Now this is stylish and chic baby bedding if I ever saw it. And in some of my favorite color palettes. See? Just cus' it's organic does not mean it has to be "blah". Yet another alternative to a bassinet or even a crib for that matter. This Humanity Co-sleeper is great for anyone practicing attachment parenting or even breast feeding moms who like their rest. It has an extra thick absorbent pad made up of 3 layers of 100% organic cotton flannel. The most basic of baby bedding, the organic baby crib sheet. This sheet made by the American Baby Company is 100% Organic Cotton Velour. This may not be baby bedding exactly but definitely falls along the same lines. This Organic baby sleep sac is stylish and helps guard against the risk of SIDS. A must have for every mom to be! Under The Nile offers this solid colored organic cotton interlock crib sheet of 100% organic Egyptian cotton. All of their sheets come with a matching bag for easy storage. 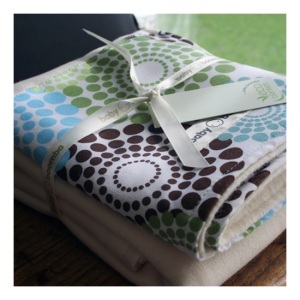 A perfectly stylish and unique baby shower gift are these Reversible Eco Blankies from Organically Hatched. 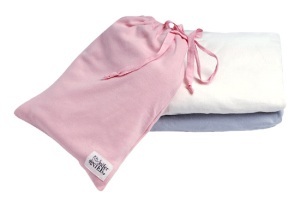 These blankies are hadcrafted and one of a kind made from bamboo fleece and bamboo french terry.